So a month has gone by since the end of Dorset Art Weeks and it’s still raining! Time to reflect on an event that never quite reached its potential due to stuff like the weather and the Jubilee celebrations, but somehow has broken new ground. I was amazed by how many more artists were using social media this time. In the two years since the 2010 event I reckon there must have been a 4 to 5 fold increase. The DAW facebook page was really active, as was twitter. Many artists and makers now also have blogs, there was a lot going on – online. That facebook group has now morphed on the Dorset Visual Artists Network which will be a much more all year round thing than just supporting artists through DAW: Much like DVA, with events like Dorset Art Fair and Dorset Art Trails taking shape for 2013. I hate taking the red and yellow signs down at the end of the event, but always try to do it that Sunday evening. A month later there are still a few signs up and around, annoys the crap out of me, just lazy. Not only that but it would be easy to use up good will with DCC, they could take a much harder line on them like Poole did and consider them as fly-posting. 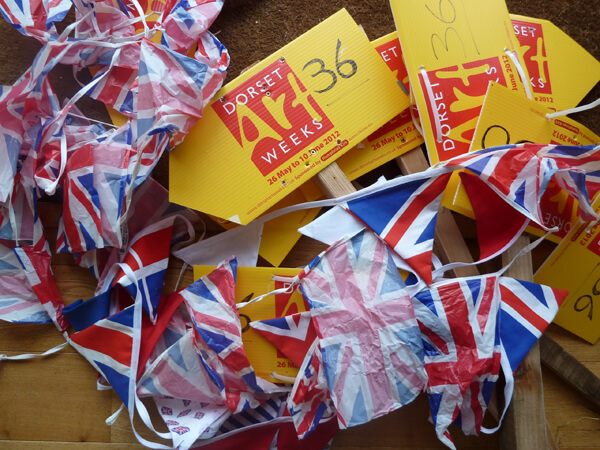 This year we also had the Jubilee bunting to fell – awful clash of primary colours! 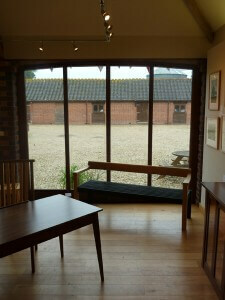 It took a couple of days to get the place straight and working again after the conversion of the hand-finishing workshop into a second gallery space. Like I said in one of the earlier DAW Diary posts, we were down about 25% on 2010 visitor numbers which certainly effected sales, but I’m not downhearted – we sold 5 pieces of furniture including the drinks cabinet and a set of Torii tables and are having discussions about a 6 metre bridge over a river and a kitchen / dining area. If either of those come off it will have been a very good DAW for us. It’s a very tough environment to sell bespoke furniture right now. Our move into outdoor work/public art and kitchens/interiors has given us a much broader profile to ride the hard times out. I think if we had stuck to just ‘pure furniture’ things would have been rather different to the positive order and enquiry book we currently have. Next event for us will be an Open Workshop Weekend in late October, details to follow. 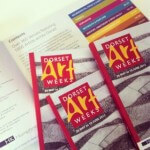 Next DVA event will probably be a first Dorset Art Trails, around Easter 2013. It’s theme will be Wood and Fibre, and yes we will certainly be participating – I’m also part curating it along with Anne Hitchcock, the textile artists from Gillingham. Onward, to the next event!